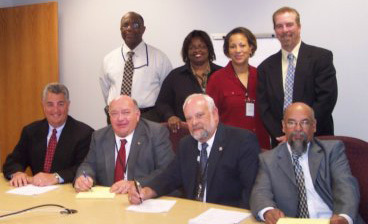 Signing the NJT agreement are, from left: seated–Mech. Dept. Gen’l. Mgr.Bob Lavell, Labor Rels. Deputy Gen’l. Mgr. William Murphy, TCU Carmen Div. Asst. Gen’l. Pres. Marvin Napier, and TCU Carmen Div. International Special Rep. Carlos Sosa; standing–Labor Rels. Dir. Phillip Charles, Labor Rels. Sr. Officer Vanessa Trapp, Labor Rels. Mgr. Agnes Duncan and TCU/Carmen Local 6053 Protective Committeeman David Rehbein. May 20, 2008—Carmen Division members of Local 6053 at New Jersey Transit overwhelmingly ratified new contract terms today: of those voting, 82 percent voted in favor. The agreement includes strong economic improvements. “The Carmen and Car Appearance Maintainers’ hourly rate of pay with compounded percentage and consolidation of rates increases will result in a rise in wages during the term of the agreement of 22.6 percent to 27.8 percent based on current classifications,” explains Carmen Assistant General President Marvin Napier. He led the union negotiating team which included International Special Representative Carlos Sosa and Local Protective Committeeman David Rehbein. A “significant improvement” allows a member who retires now to receive retiree medical coverage under the basic plan, with his or her spouse, beginning at age 60 at no cost to the retiree or spouse. Among other highlights, the contract includes enhanced benefits for dental and eye care; oral contraceptive coverage; payment for unused sick days; sick leave reimbursement when an employee leaves; and an increase in the supplemental sickness benefit. The annual tool allowance was also increased, as was the annual clothing allowance for car appearance maintainers.